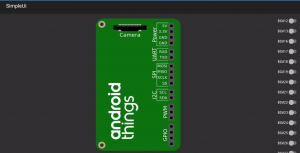 Android Things is Google’s new IOT Android based platform. In essence it’s a slightly altered version of Android which can run on Iot type devices such as the Intel Edison and the Raspberry Pi3. Personally I’m not yet too impressed with Android Things. It is still very new and very raw and is lacking a lot of what you’d expect from an Iot platform. However, having finally a standard Android implementation officially from Google running on these devices has to be a good thing. The platform should just get better from here. Of course being Android, Android Things works with Xamarin too. Using Xamarin will also be a benefit for all those awesome cross platform benefits it offers, like sharing your Iot code with your backend services, Android, Ios, Windows Phone, Windows 10, OSX, XBox and whatever other devices you’d like to be supporting in your solution. Getting the devices to appear in Visual Studio is exactly as you’d expect. The devices will use the standard Android Debugging Bridge (ADB). 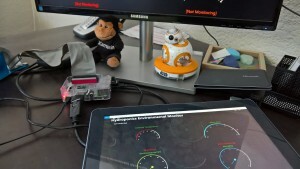 Plugging in an Intel Edison via USB will be reflected as “Unknown Iot_Edison”. You can obviously also use the network debugging features of ADB. eg. 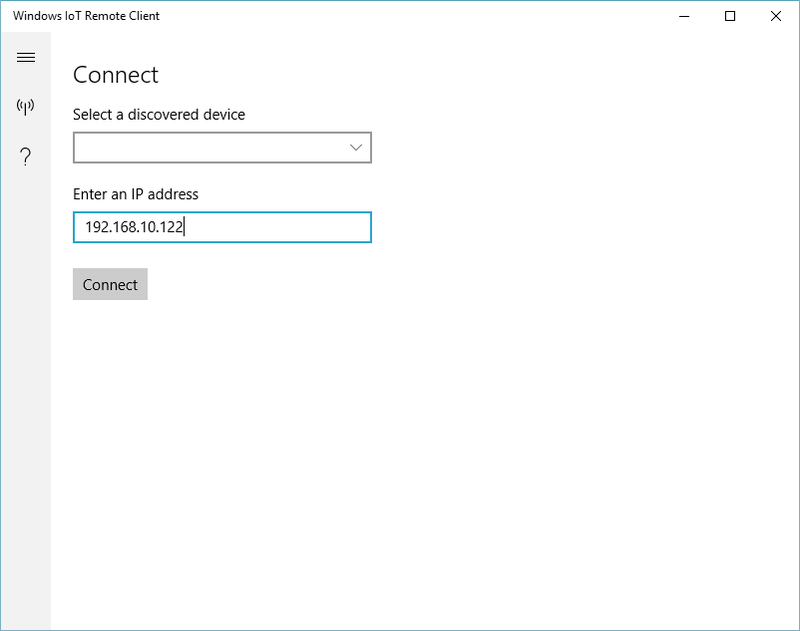 adb connect <ip address> The device will then also be detected in Visual Studio. A Raspberry Pi will appear as “Unknown iot_rpi3”. Using Xamarin is very simple. 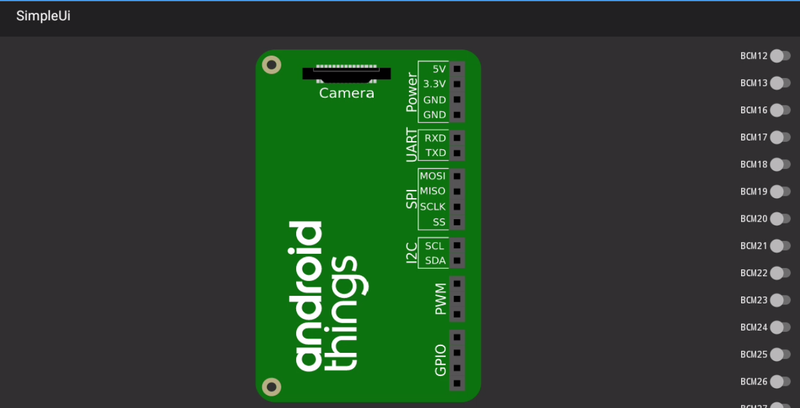 All we need to do is bind to the Android Things API Jar to be able to make use of all the features provided by the Android Things SDK. At this moment in time there isn’t an official release Nuget package from Xamarin to do this. It is however very simple to do this yourself. In this sample (and I’ve shared the code on GitHub) I’m binding to the new Dev Preview 2 API for Android Things (androidthings-0.2-devpreview.jar). Once the binding project is referenced from your Android Things project, everything will work as expected. Just of course with the benefit of using C# and not Java! No Iot sample and demo is complete without a blinking LED. This sample is a conversion of the Android Things sample. This sample is a simple illustration of using a UI on an Android Things device. It also illustrates GPIO pins and how to set the high/low values of the pins. Happy Android Things Development with Xamarin! 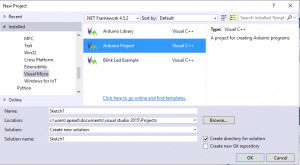 Visual Studio has become a one stop shop for any type of development. 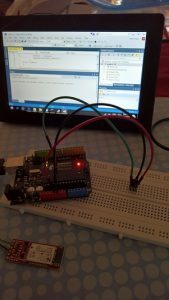 But did you know you can do Arduino development as well? 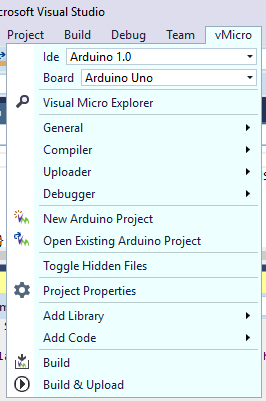 There is a Visual Studio extension called Visual Micro (http://www.visualmicro.com) which will allow Arduino development and debugging within Visual Studio IDE, with the full development experience you have become used to. This is a high level overview of what is provided. What’s really great about having Arduino support within Visual Studio is, you can group together all the various different projects that makes up your solution all together within a Visual Studio Solution. In a world of Iot and cross platform (or multi platform) development this is perfect. 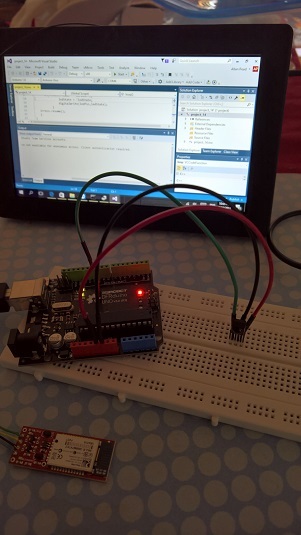 You could have one or more Arduino projects, .NET Micro framework projects, a Xamarin Mobile client and the back-end (be it an on-premise ASP .NET WEB API solution, or in the cloud with something like Azure Mobile Services) all managed together in a single Visual Studio solution. 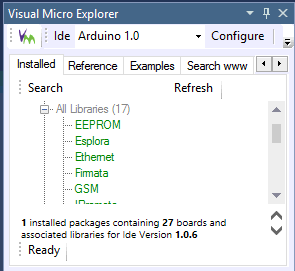 Visual Micro can be downloaded here: http://www.visualmicro.com/page/Arduino-Visual-Studio-Downloads.aspx It is a Visual Studio extension which will be installed within Visual Studio. 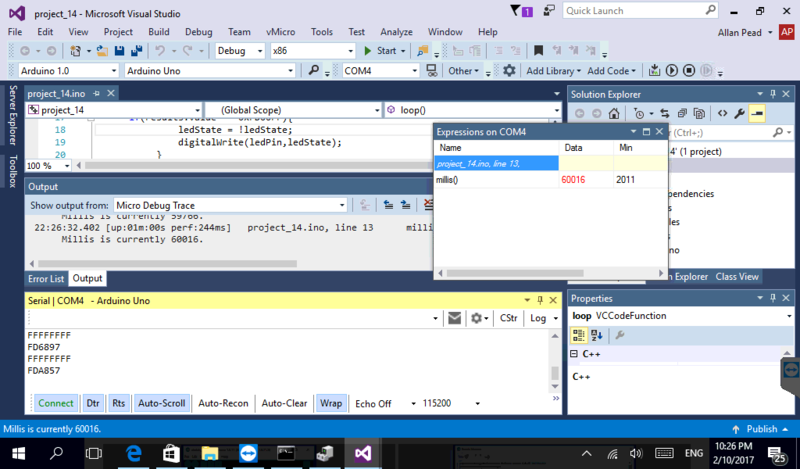 There is a version for both Visual Studio 2015 and 2017 RC. Be sure to have the standard Arduino IDE installed as well, as it uses this tooling under the hood. Arduino version 1.06 – 1.8 is supported. 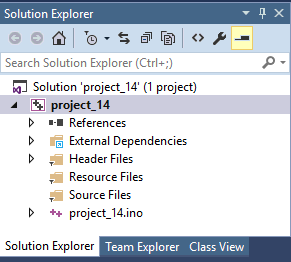 Both a toolbar and a new menu is added to Visual Studio. The toolbar allows access to quickly configure the connected board and COM port used (via USB). It also allows quick access for building and debugging, however if the Arduino project is the startup project the debugging and build options work as usual direct from the Visual Studio hotkeys, toolbars and menu items. The menu allows for deeper configuration of the compiler, debugging options and other integration options. Templates are provided to easily create a new Arduino Sketch or Library. Standard Arduino INO files are supported. These standard file types are also used when opening and saving to existing Arduino Sketch files, which ofcourse can be ported back to the Arduino IDE if need be. The solution explorer is quite neat for the Arduino. All the source files, header files and external dependencies are presented in much the way you have grown accustomed to in Visual Studio. The Visual Micro Explorer provides a visualization of all libraries installed. There is also reference material and documentation provided along with a collection of Example code. This is great for both learning and quickly looking up something. The live tracing works great. There is also the standard port monitor which does live logging of the Com ports. In the screenshot provided the codes displayed are being reported from an infrared remote control in real-time. The ability to see everything happen, and be visible, at once in an IDE saves a whole load of time. I’ve been using Visual Micro for a few Arduino related Iot projects and can definitely recommend using it. 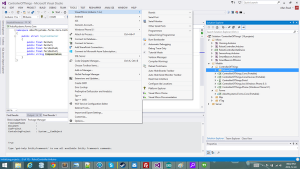 Day 1 of Build 2015 has been great! The IoT inclusions especially have been very exciting for me. Also very interesting and exciting news is, we have Arduino support from Microsoft. 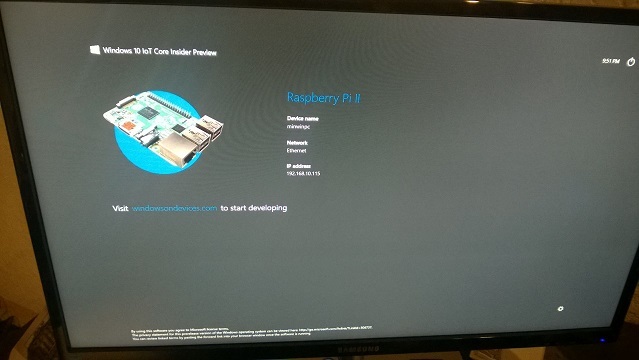 Start by downloading the “Windows_IoT_Core_RPI2_BUILD” from “https://connect.microsoft.com/windowsembeddedIoT/Downloads“. I had to accept some EULAs and click around before anything appeared to be selected for download. It could have also been a timing problem as I was a bit eager to download and perhaps it was not available that soon. The requirement for the installation is a Windows 10 Build 10069 or higher PC to copy the Windows 10 IoT installation onto an SD card . I downloaded the new Windows 10 Build 10074 ISO that was released today from “http://windows.microsoft.com/en-us/windows/preview-iso-update-1504“. Install Windows 10. I ignored the recommendations and installed on a Virtual Machine (on VMWare) and not a physical PC. 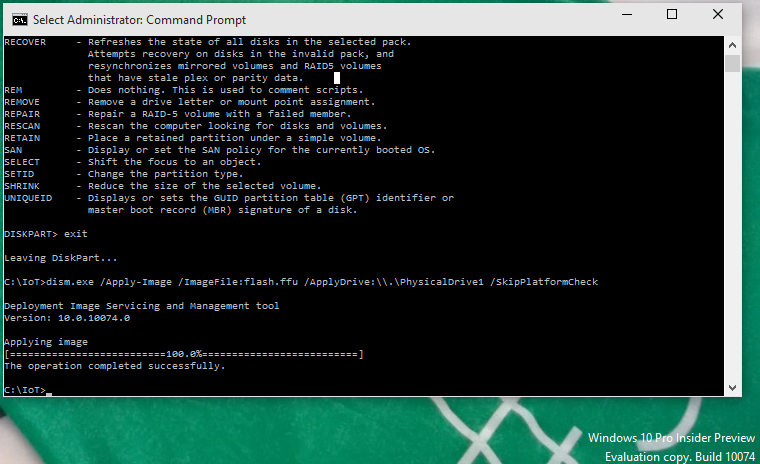 VMWare passes through the SD card without problems to Windows 10. Once everything is installed, copy the “Flash.ffu” file from the downloaded “Windows_IoT_Core_RPI2_BUILD” zip file to a folder on the Windows 10 PC. Note the number of the disk associated with the SDCard. Run the dism command replacing the N in “\PhysicalDriveN” to the number noted above. After a short wait, you should see: “Operation completed successfully”. Eject the SD card. Insert the SD card into the SD card slot in the Raspberry PI 2. Plug the HDMI cable into the PI and of course the monitor. Plug the power cable into the Raspberry PI. After a few worrying minutes Windows 10 IoT should be all booted up. It will reboot once during the initial setup process and the interesting blocks displayed in-between the Windows Logo appearing and final boot-up seems normal. Microsoft is doing a lot of great things at the moment. One of these is the ability to run ASP .NET vNext away from a Windows Server, and away from IIS. Being a ASP .NET Mvc developer for a few years now, the idea to run on any environment is quite liberating. A pcDuino is a device with tons of potential. It’s a powerful device and it really is a full “mini PC” with enough processing power to do interesting things like image processing. But is small enough to be used in situations where you would uses an Arduino, Netduino, RFduino etc in the IoT or maker space. The pcDuino also has an Ethernet port and on-board WiFi, so it is a rather compelling internet connected device. 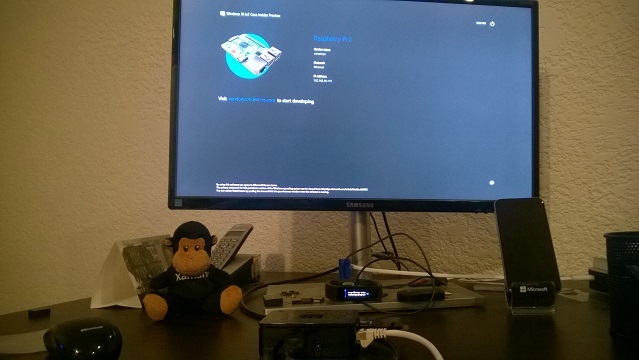 Having deployed Mono on my board already, it was also a no brainer to extend that and to explore the potential of an internet connected device but leveraging ASP .NET vNext to do that. 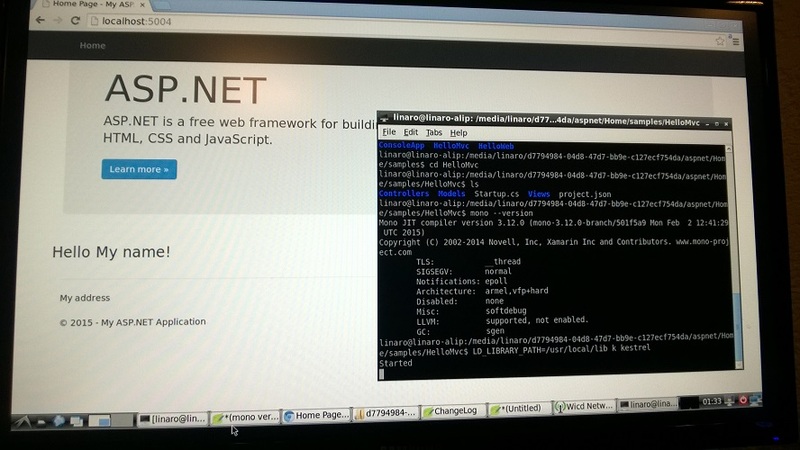 Now that we have both Ubuntu and Mono installed, we can now begin getting ASP .NET vNext up and running. Lets start by installing the necessary certificates. Download and execute the KVM installer on the ASP .NET site. As of writing this, the master branch has the 1.0.0-beta1, so we will use that. Check to see if the installation is correct, you should see the version number reflected with the list command. If git is not already installed, install git next. The web server ASP .NET vNext uses (Kestrel), is based on Libuv, so we need to install that next. Now we need something to run. Lets use one of the samples from the ASP .NET github repository.for simplicity. Clone the aspnet repository. Focusing on the Mvc example, change to the directory “HelloMvc”. To resolve and download the necessary dependencies for the project, execute a restore command on the package manager “KPM”. We need to set up a symbolic link for libuv to avoid any “Object Reference not set to an instance of an object” errors. This is not the most helpful or informative of error messages, but we get what it means. If all goes well you should see “Started” appear on the command line. The default port for kestrel is 5004. 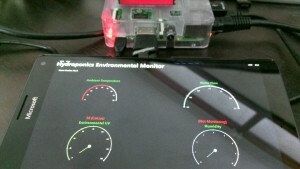 As a test navigate to “http://localhost:5004” using the internal pcDuino Chromium browser. 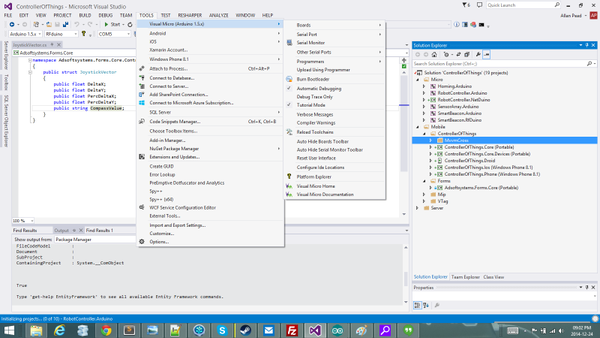 The sample ASP .NET Mvc application should appear as below. Find the ip address of the pcDuino using the ifconfig command. 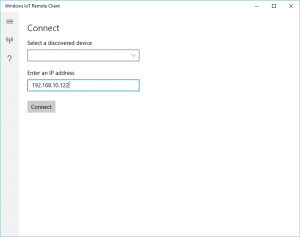 Use this ip address from a remote device (or pc’s) browser. The great feature of the pcDuino that it is equipped with both an Ethernet port and WiFi so connectivity is very easy and convenient. 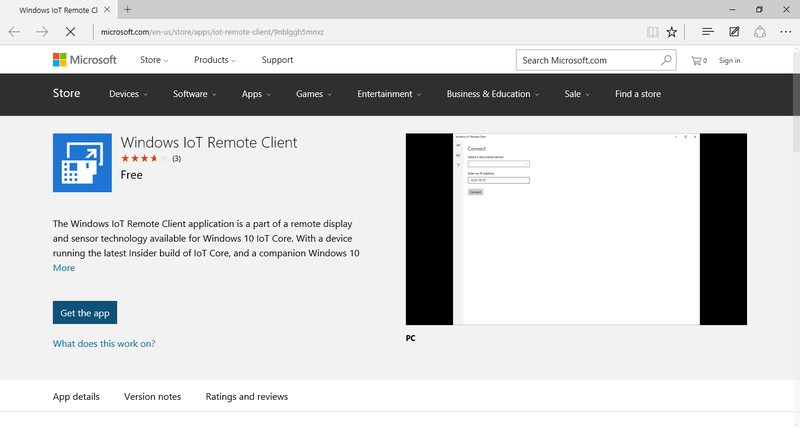 Congratulations you now have a Mono / NET powered IOT device running ASP .Net vNext! A mobile wireless web server / web connected device has endless potential. In future blog posts I hope to explore some of those.